Tells the story of Tim DeChristopher's extraordinary, ingenious and effective act of civil disobedience drawing attention to the need for action on climate change. BIDDER 70 is Tim DeChristopher, the student who monkey-wrenched the 2008 fraudulent Bureau of Land Management Oil and Gas Lease Auction. Bidding $1.8 million to save 22,000 acres of pristine Utah wilderness surrounding Arches and Canyonlands National Parks, with no intention to pay or drill, Tim brought the BLM auction to an abrupt halt. A month later, Barack Obama became president and on February 4, 2009, new Interior Secretary, Ken Salazar, invalidated the entire BLM Auction. Nevertheless, DeChristopher was indicted on two federal felonies facing penalties of up to ten years in prison and $750,000 in fines. During the two years awaiting his trial, DeChristopher stepped up his activism, evolved into a climate justice leader, and waited through nine trial postponements until, on February 28, 2011 his trial began. BIDDER 70 is Tim's journey from economics student to incarcerated felon. Amonst those featured are Bill McKibben, James Hansen, Robert Redford, John Schuchardt, David Harris, Larry Gibson, Terry Tempest Williams, and members of Salt Lake City's Peaceful Uprising. "It's easy to feel helpless in the face of corporate power and the growing environmental crisis. It's easy to feel despair. Bidder 70 is about what's possible when we stop being afraid, and start acting on our conscience; a smart, candid look at one man's story that speaks volumes about what's at stake for all of us." "Bidder 70 highlights one of the most important contemporary examples of environmental civil disobedience...In following Tim DeChristopher's development from a student to one of the most charismatic and dedicated leaders of the climate movement, this documentary not only discusses the importance of addressing climate change, but the value of civil disobedience in bringing about social change. This is a powerful film that will inspire students to question their commitment to the world and to fight against global injustices." "Tim DeChristopher's courage is a clarion call for citizens to face up to the dangers of climate change and to take seriously the provocative questions Bidder 70 raises about the necessity of civil disobedience in twenty-first century America." "Is Tim DeChristopher an unrepentant folk hero?...Was he prepared to pay the consequences, even if it meant going to prison? Viewers can choose for themselves what they might have done in this intriguing story of civil disobedience that questions public lands policy and industry control over a key federal agency." "BIDDER 70 depicts the highs and lows of activism. We see more than just the story of DeChristopher--we see how he plays a part in a vast social network of environmental activists. With its focus on tactical innovation in environmental social movements, as well as its depiction of the frustration of working through the government and legal system, this film would work well in college courses on social movements, environmental sociology, political science, and criminology. I look forward to using it in my Environmental Social Movements class!" "Tim DeChristopher is known as an economics student who went to jail because he disrupted a controversial federal oil lease auction. This movie allows DeChristopher to tell the rest of the story. Bidder 70 shows how DeChristopher's concerns about climate change, preserving southern Utah's iconic wilderness, and corporate involvement in democratic governance sparked a broader debate about civil disobedience in the twenty-first century." "Bidder 70 tells a uniquely American story...DeChristopher's ability to move with intellectual seriousness and a light heart between festivals and courtrooms complicates the popular idea of The Man and what his brand of power can achieve." "Highly inspirational....Without the slightest tinge of manipulation, Bidder 70 convinces us that these people really do care about the fate of humankind and that we're entrapped in a legal system that is, environmentally speaking, still set on driving us off a cliff." "The DeChristopher case really speaks to a newer phenomenon: the attempt to elevate economic interests over freedom of speech, wherein a growing number of right-wing lawyers and judges are interpreting (or reinterpreting) laws to privilege corporations over individuals, and elevate business efficiencies over the messy, time-wasting distractions of full public debate." "Nails the way that a spontaneous act of courage can focus the mind and clarify an ideology...We hear not the legal machinery humming inexorably in the background but the mental gears of an activist clicking into place." "An engrossing, thoughtful film. It operates on many levels - including the revelation of the tarnished hypocrisy of justice under the Obama administration - but always returns to DeChristopher's earnest commitment to act with courage and conviction, regardless of the legal consequences." "Bidder 70 reveals how conscience, consciousness and peaceful civil disobedience remain powerful weapons in the arsenal of dissent...Beth and George Gage have created a well-crafted, inspiring documentary full of fighting spirit." 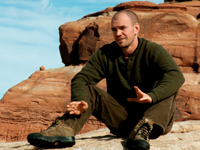 "[Tim DeChristopher] was one of the most courageous and principled civil disobedience activists in recent American history...The film is not only valuable for telling Tim's story but that of the movement in Utah as well. You hear from dedicated activists and see how they organize their creative and compelling protests." "This story of DeChristopher's act and personal experience of civil disobedience, of the support this act galvanized and of the powers arrayed against him is a must for every library collection - public, school, academic, and especially law school libraries and every U.S. Attorney's office." "A well-made and affecting documentary...A beautifully told story of a hero's journey filled with passion and sacrifice that tugs at the head and heart to the final scene." "A popular appeal befitting the newly energized movement DeChristopher helped create...Bidder 70 is ultimately about people power and one of the many forms it can take. By the film's end, DeChristopher's audacious direct action seems not only heroic, but also accessible, possible, and perhaps one of the few real ways forward." "Inspiring...Directors Beth and George Gage brilliantly tell the story of climate activist Tim DeChristopher...DeChristopher's actions and sacrifices draw attention to the lack of an American energy policy that eliminates subsidies to the fossil fuel industry and creates a path toward a renewable energy future." "A gripping personal story that reveals just how bizarre and twisted our justice system can be...A straight up and compelling story. The film has no gimmickry. It doesn't need it. The story is that good, and the filmmakers have understood and presented all of the elements necessary to make its message personal and affecting. This must-see film will give you a better understanding of the environmental movement, and will change the way you think." "Topped my list for the most inspiring film." "Powerful, intelligent and very entertaining, BIDDER 70 will show you how one person can change the world." "A film everyone needs to see, even if you think you're well-informed about political issues, environmentalism, and global climate change." "This thoughtful doc vividly illustrates the personal consequences of daring to take on the government...It's hard not to be amazed by the sheer waste of effort and expense incurred by the lengthy legal battle, which is vividly conveyed by the clearly impassioned filmmakers. By the time you've finished watching Bidder 70, you'll be left both angered and hopeful." "A touching look at a man willing to do anything to give a voice to the voiceless masses...[The filmmakers] paint a portrait of a man who truly wants to do better by this world, if not for himself, for generations to come." "DeChristopher and a new generation are ready to break the rules in innovative ways...A thought-provoking documentary about the growing field of eco-activism, this is highly recommended." SDH captions for the deaf and hard-of-hearing and scene selection. Explores the sea change in national attitude from pride in big dams as engineering wonders to the call for dam removal as awareness grows that our own future is bound to the health of our rivers. Examines the challenges that climate change poses and discusses meaningful action that can be taken by individuals and communities. The new feature-length version and final chapter in the saga of the postman and the gardener who took on McDonald's. And won. The Academy Award-nominated story of the radicalization of an environmental activist, from his involvement in and later disillusionment with Earth Liberation Front sabotage, to his eventual arrest by the FBI and incarceration as a domestic terrorist. The story of how America led the world to solve the ozone crisis. Will we dare to do the same with climate change? Ocean acidification threatens over one million species with extinction--and with them, our entire way of life. Filmmakers Judith Helfand and Daniel B. Gold use humor and chutzpah in their search for the environmental truth about vinyl. Examines the media strategies, on both sides, that have resulted in the US government's failure to take decisive action on global warming. Tells the inspiring story of four battles in which Native American activists are fighting to preserve their land, sovereignty, and culture. Two daring political activists, posing as top executives, infiltrate conferences and pull off pranks designed to provoke better business practices. The amazing story of the fight to clear Earth First! activist Judi Bari's name after her car was bombed and she was arrested as a terrorist. The documentary of record on the environmental movement. Master Sgt. Jerry Ensminger reveals the Marine Corps' cover-up at Camp Lejeune of one of the largest water contamination incidents in US history. An intimate portrait of international water activist Maude Barlow and the debate over whether water is a commercial good or a human right.